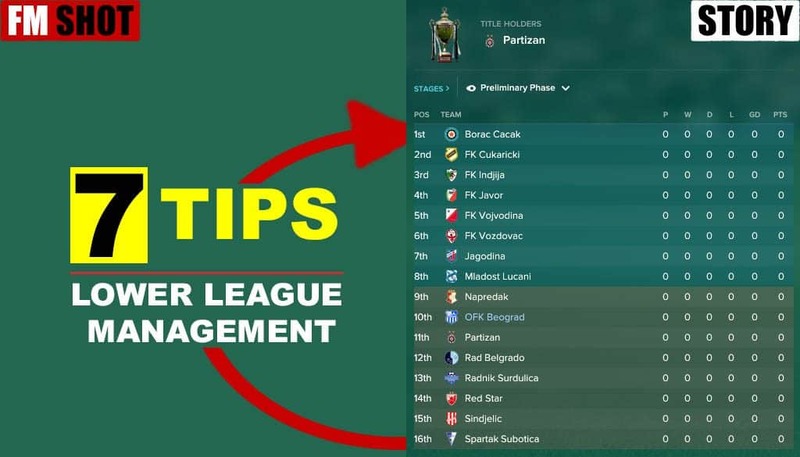 7 Tips for Lower League Management - Staying up after promotion? I finally achieved the main goal, and that’s where the best teams of a nation were! Having spent three years at club, my result was the following: 2x Promotion and 1x National Cup. The bad sides of the story are, easily missed points against weaker opponents and poor transfer policies. This is a key question! My budget was small in the first season. Some ridiculous figure EUR 186K. In this way, I’ve gotten a message that the “transfer market” was closed to me! Can you buy a good player for 15-20K? Theoretical YES and practically NO. That’s why I’ve decided to give the chance to young players, and my biggest success was a free transfer – a player with international experience. I currently have 59 players. Each of them has a clearly defined status in the club, and the options are as follows: key player, first team, rotation, backup, hot prospect, and youngster. Simply, I like to look at the player profile and determine the role in the team, based on the given information. For example, players, who are in the B team, can have max status – Backup. On the other hand, young talents (Under 19s) have only two options – hot prospect and youngster. The best players are reserved for the First Team! However, good results on the pitch, move a player’s status one step ahead and vice versa. It is important that the prize arrives in time, and that’s the end of the season or half-season. 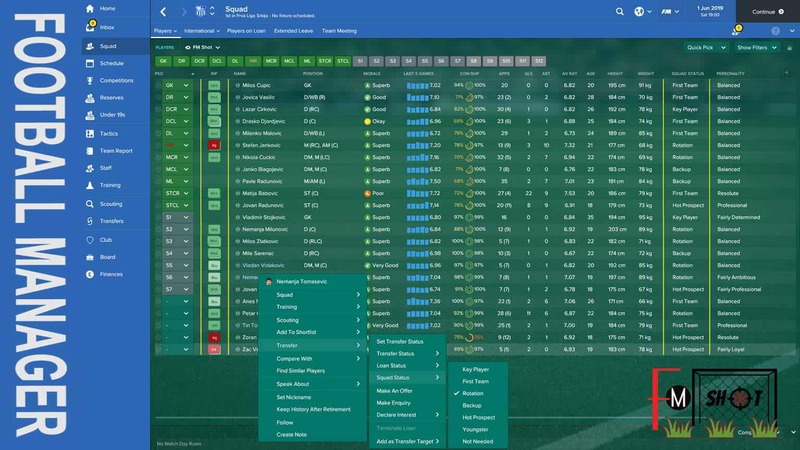 When I train a club that is fighting for promotion to the next league, I forget about my favorite formation. Wishes are one thing and the possibility something else. Instead, I’m trying to form tactics around key players in the team. For example, my best players are at DC, DR/L, MC, and MR position. Maybe I love 3-4-1-2, but a far better solution is the classic 4-4-2. That doesn’t mean I won’t use both formations! But … advantage will have 4-4-2. I have already written an article on this topic. The point is that every player must take training seriously, regardless of whether it is located in the First Team or Under 19s. My first task is the formation of healthy competition – 2 or 3 players for a certain position in the team. In this way, a motivation for training is encouraged. The key is discipline – praise or criticism. Without them, there are no cheap solutions. I was lucky in the choice because I found an excellent parent club. It’s Red Star Belgrade. 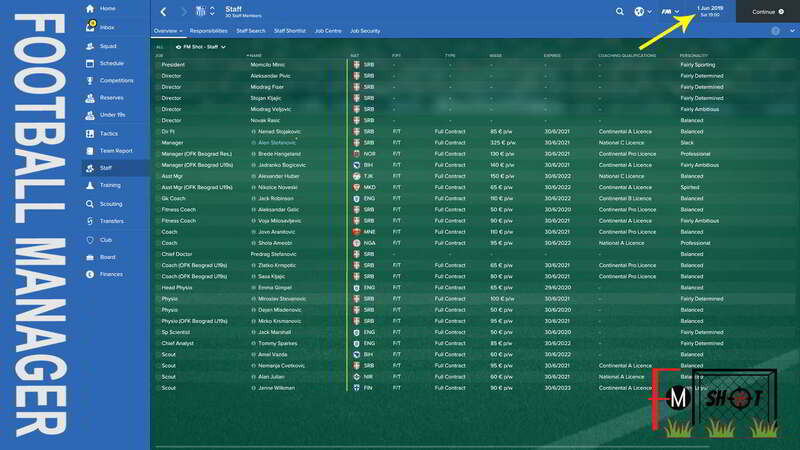 Every season, I have signed a number of great players on loan. At least 2, but not more than 4. At this point, the cooperation between Red Star Belgrade – OFK Belgrade has been interrupted because both teams are in the same league. But that doesn’t matter since my club has EUR 1,951,101 in the budget. 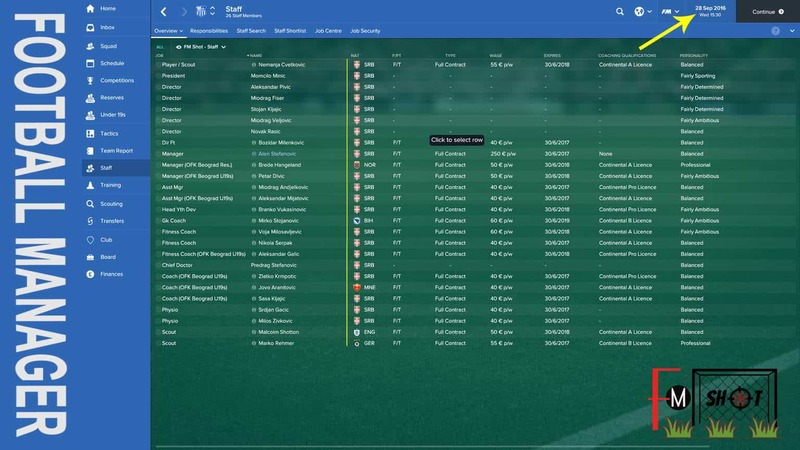 In the first season, my focus has been on loans and free transfers. It appeared an interest for key players in the team, when I have made good results. I was against any sales because I wanted to gradually make the team. But it was not possible. The major problem has been the debt – EUR 4.7M. If the offer came above 250K would be automatically accepted by the board. What would be the ultimate outcome? A weakened team and a little money in the budget. I didn’t want that! 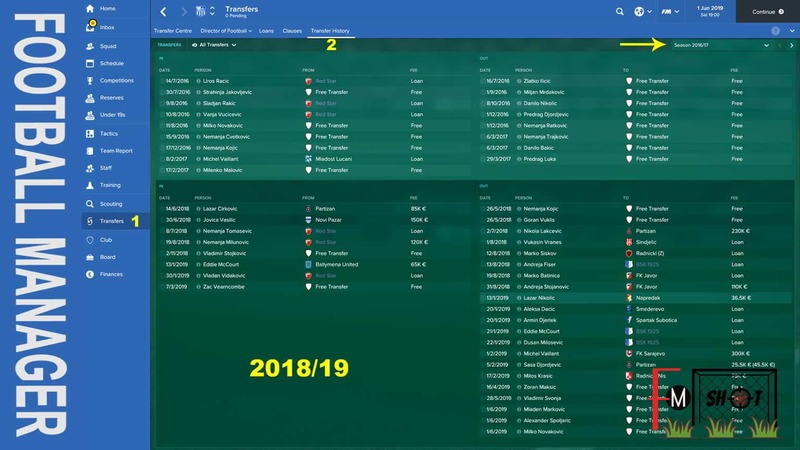 That’s why I made 3 good transfers and bought the time for the next 2 seasons. Big changes followed at the beginning. If I remember well, 90% of staff members fired (mutual termination). After that, I’ve tried to find the right candidates. Local experts have had the advantage. But … It’s better to go the hard way sometimes. I have sent scouts to England, France, and Germany. 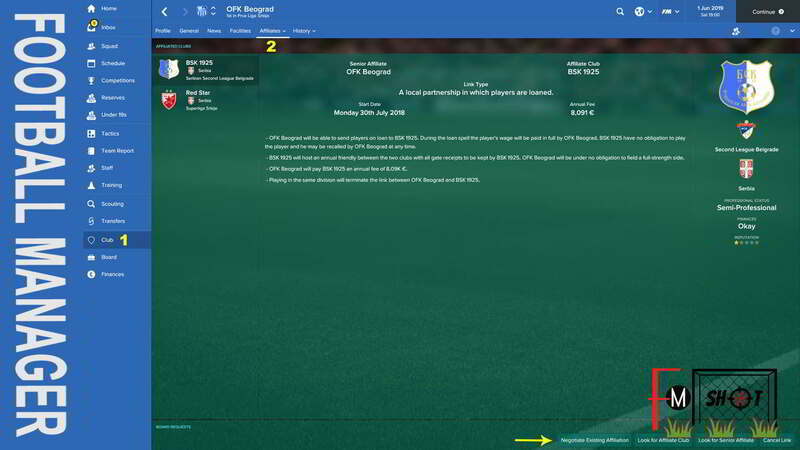 The goal was not to find a good player but quality experts for the staff members option. It turned out to be a good move! The first place on the table causes a gentle smile on my face because I know that the time spent on the computer, is not futile. However, I wouldn’t mind to spend another season in this league. Statistics are not as important to me as the fact that I am making a good team. I am happy to see that everything works great in training, players are gradually progressing, and the greatest joy is an uncertain match. That’s exactly what happened. National Cup final, between OFK Beograd – Zemun, was the match of the season! I lost 5-4. I don’t regret the defeat because the Cup was not a priority. On the other hand, I would change the first place in the table for another such match. Where’s the OFK Beograd now? In the company of the best. 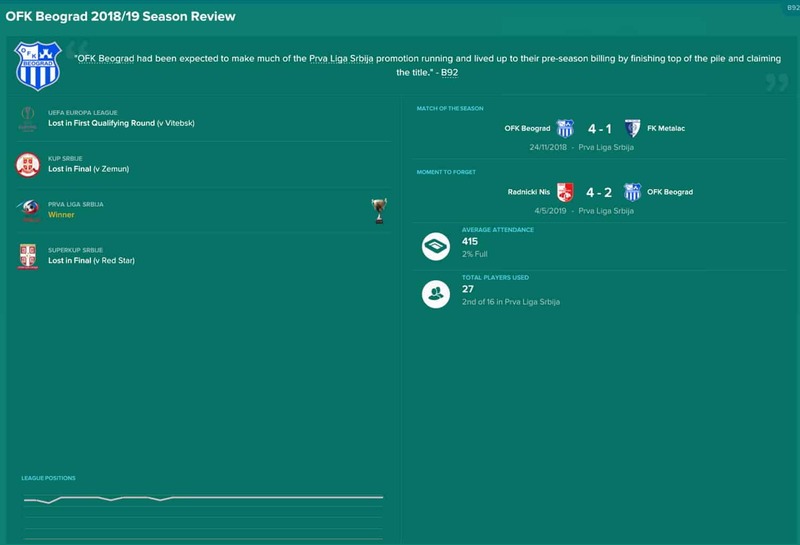 Although the Serbian Superliga is in the 26 place (FM 17 – competition reputation), for me is a big challenge. In the first season, my goal will be to avoid relegation. If I succeed, my ambitions are growing. I want the club to take the place on the table that will provide qualifications for the Europa League. Of course, this takes time. But the rules remain the same! I’ll buy players if I find it necessary. Loans are still the best solution. On the other hand, I will have given a chance to young players who have raised in the club. Everyone will have “their 5 minutes” at home while experienced players will have the advantage on away matches. I never expected to get an FM email that followed the events in the real world. It’s about Brexit. I decided to share this with you and attach a photo. That’s it. If you have a comment, I would love to see it in the section below. If you believe that this can be helpful to someone, there is the option Spread The Love.